9 × nine = Required Please enter the correct value. 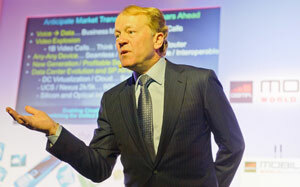 Since John Chambers stepped in as CEO in January 1995, Cisco Systems Inc. (Nasdaq: CSCO) stock is up more than 1,500%. But after two decades at the helm, Chambers will be stepping down. In July, 17-year Cisco vet Chuck Robbins will take over the reins of the networking hardware titan. And with Robbins already naming his executive team ahead of next month's transition, investors wonder what this regime change will mean for CSCO stock. Cisco is the undisputed leader in its market. It leads market share in switches at 56.8%, routing at 47.8%, data center network hardware at 46.9%, and even to a lesser extent, IP telephony and Wireless LAN at 28.3% and 24.7%, respectively, according to Bloomberg Intelligence. The best-case scenario for CSCO stock with Robbins stepping in as CEO is that investors will be excited by a long-awaited change in management and give it a little jump. "I'm encouraged to see they're changing leaders," Money Morning Defense and Tech Specialist Michael A. Robinson said. "I think that Chambers has been there a little bit too long." At worst, CSCO stock will be unmoved by what is a rather underwhelming transition. But that will hardly be enough to diminish the value a name like CSCO stock can bring to your portfolio. It's important to note that Robbins is a business-as-usual company man. He won't depart from Chambers in any radical way. Robbins is not going to do to Cisco what Satya Nadella did to Microsoft Corp. (Nasdaq: MSFT) when he took over for former CEO Steve Ballmer last year. But then again, Microsoft needed a big change. Cisco doesn't.